I can’t recall where I was when I heard that twelve people were gunned down in a packed bar in Thousand Oaks, California, and that troubles me. 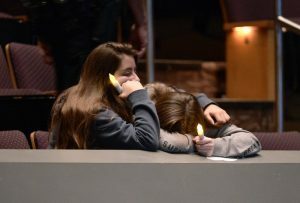 There was a time when I could remember the surrounding details on hearing these reports, where I was and who I was with: Columbine; Sandy Hook; the Las Vegas Massacre; and Stoneman Douglas High School. I was shopping with my family for Christmas, visiting my daughter while she was in college, driving highway 85 between Thomasville and Charlotte, and so on. Lately though, when I hear of innocents gunned down, the time and place escape me. College students have their lives taken from them, and I’m not stopped in my tracks. I keep thinking whatever it was I was thinking and doing whatever it was that I was doing. It comes to me as something that was—how shall I say it … expected? I’m not surprised. Scientists call my response compassion fatigue. They say it is my mind and body’s natural way of protecting myself from an overload of anxiety and depression. I appreciate the insight. If I lose a night’s sleep every time I hear some crazed man has slaughtered a gathering of people I would be unable to function and do the things I need to do, like show up for work. I need to know I am relatively safe when I dash out of the grocery store and into a dark parking lot. Even so, I am not satisfied with the way I have become as a Christian, whose Lord loved the world so much he gave his life for it, nor as an American citizen, whose county began with the phrase “life, liberty, and the pursuit of happiness.” A callous exterior has begun to grow around my soul, and it has made me less than what God intended. He has found that we can choose to live in such a way that strengthens the mind for compassion. Our brain is a muscle that can be physically conditioned to do good in the world. Indeed, by living right, even the amygdala, that “fight-or-flight” place in our brain that has been with us since our beginnings, can shrink. “And we see other parts of our brain,” parts that lend toward open-heartedness, “actually thicken in gray matter.” Like a runner who strengthens his heart and legs for a foot race, we can increase our capacity to be kinder and more compassionate. My thoughts turn to John Wesley’s words when he spoke about the means of grace, those spiritual practices that open us up to God’s grace, and strengthen our faith. He divided them into two types, works of piety and works of grace. Works of piety are studying the scripture, prayer, meditation, fasting, and attending public worship and the like. Works of mercy would include visiting the sick and the prisoner, feeding the hungry, welcoming the stranger, and giving generously to the needs of others. Lord Jesus, tone my cerebral cortex and keep me openhearted.